We’ve all got our own version of wanderlust. Some are looking to scale peaks and reach for the skies, others want to surf the waves, and there are those who look for lush greenery in search of hidden vistas. Our country is filled with many gorgeous spots and the trio behind The Philippine Roadtrip, aka “The Baconeers” composed of architects Alfie Agunoy, Francis Sta. Romana, and photographer Paul Quiambao wanted to experience traveling as much of the Philippines as they could. Bitten by the curiosity bug, Alfie mapped out the 12,000-kilometer road trip that would pass through Luzon, Visayas, and Mindanao. Francis, meanwhile, enrolled himself in a short course to learn more about troubleshooting engines; thy will need a trip mechanic, after all. An itinerary of such proportion won’t be complete without someone documenting it. Not confident with their own camera-skills, they decided to look for a pro to join their adventure. That’s how Paul, a professional landscape photographer, entered the picture. With Alfie taking care of the itinerary and logistics, Francis serving as the trip mechanic and Paul assuming the role of documentarist, the Philippine Road Trip plan took shape. Initially they considered going by motorcycle, but that route would cost them more in accommodation and will have them scrambling for necessary supplies. “We decided instead to get a vehicle big enough to let the three of us sleep inside and still leave enough space for our equipment,” Francis said. Pooling their money together, they searched for second-hand vans through online classifieds site, OLX. 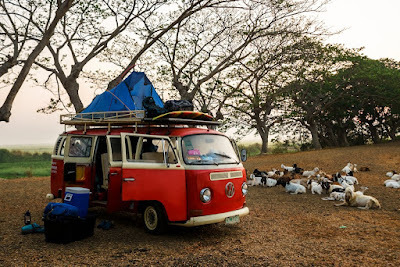 “When we saw this red, vintage Volkswagen Kombi van, we reached out to the seller and scheduled a meet-up right away. Upon seeing it, the three of us had a kilig moment—it was love at first sight,” shared Alfie. They sealed the deal with the owner and gained a friend too. “He was honest enough to explain to us what he was selling and how we should deal with eventual kinks,” added Alfie. With Cupcake and a solid plan, they were ready to take on the road. Days leading to their trip’s flag off, they felt something was amiss. “We felt this adventure should create social impact to affect lives, not just ours but also those who we come across as we see the sights and experience the local culture,” said Paul. The Baconeers approached the My Shelter Foundation and were connected with Illac Diaz, founder of Liter of Light who provides sustainable solar lamps to areas without electricity. Their trip would take them to far flung places and they can best help the cause. With a purpose to further fuel their trip (aptly called “Light-up Philippines), they finally set out to travel. Initially, their plan was to go for four months for them to cover the entire 12,000 kilometers. But because Cupcake is 47 years old, she broke down several times. Being in it for the journey, the Baconeers found ways to get the van going, enjoying every moment of the trip that lasted 10 months. “It’s quite rare to find parts in Metro Manila alone, and even more so in the provinces. Every time parts broke down or showed signs of breaking down, we’d go back to OLX and found parts, and had it delivered to where we are going—a strategy we used within the duration of our journey,” shared Alfie. The delays led to more savoring experiences as the trio immersed themselves in the different localities they were in. When they reached towns that didn’t have electricity, they distributed solar lamps and taught the locals how to use them. What they saw along the way made it even more worthwhile. “Nung nakarating kami sa Mountain Province, nakita namin yung kids walking at the edge of the rice terraces at night, yung moon lang ang ilaw nila! May ibang communities naman sa Babuyan Islands, mga painted stones naman ang reflector nila sa roads pag gabi,” shared Francis. Seeing smiles from lamp recipients instilled deep feelings of gratitude among the Baconeers. The people whose lives they touched also unknowingly helped them finish their trip. “Their reactions in receiving an unexpected solar lamp they badly need is really priceless. In return, they gave us rice, bananas, or any other food to show their gratitude which helped us too,” Alfie said. Long months away from their professional lives, the trip had to end. While the amazing views they saw and cultures they experienced have enriched their lives further, they also learned more about the best way to live moving forward. We all travel to unwind and reset the mindset. But take it from the Baconeers: A purpose-driven trip and traveling sustainably go a long way in enriching your life. 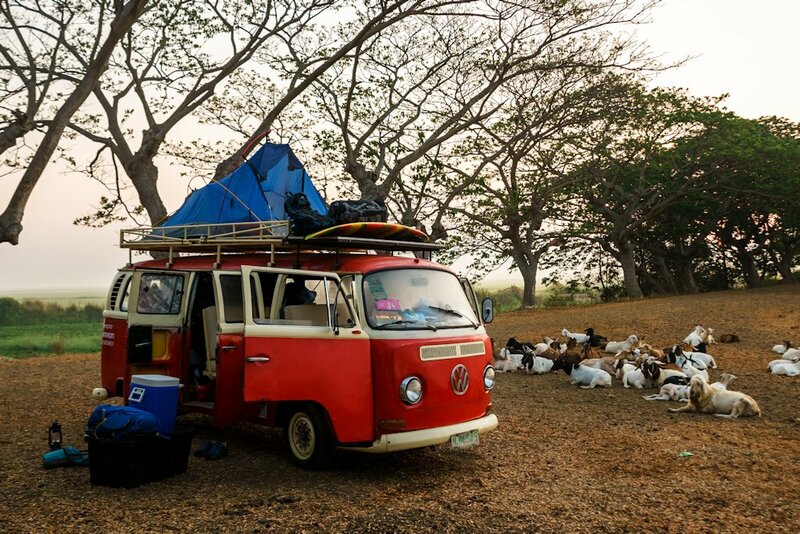 Who knows, your own epic experience is just a road trip, and a second-hand Kombi van from OLX away too. Read more about The Philippine Roadtrip via their Facebook page.